BHARAT SCIENTIFIC WORLD provides a complete turnkey solution for your lab requirements. 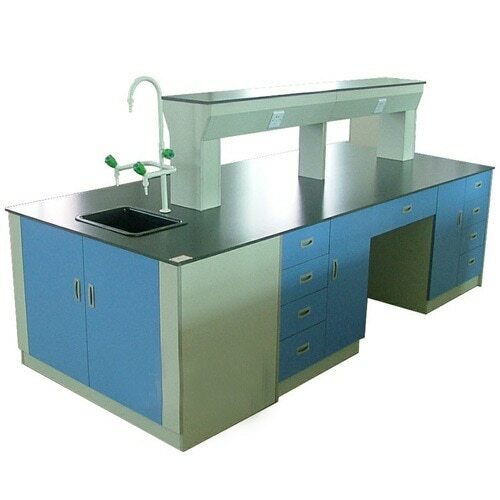 We offer lab designs and layouts, lab furniture, different kind of workbenches, consultation etc. We have a skilled team of professional designers, experienced technicians, and talented execution team. We do everything Every workspace environment has its own special requirements. We offer a wide range of standard products and solutions for numerous industry sectors. Our large variety of products and services ensures that you get everything you need from one place. Lab Furniture Lab Interiors Lab Consultants Manufacturing and supply of Lab Furniture Lab Storage such as Cabinets, FRP storage, Lab Cupboard, etc Fume Hoods Laboratory Accessories such as Lab Sinks & Faucets, Lab Stools, Gas Taps & Pipeline Refurbishing and Renovation of Existing Lab Consultation services Aluminium Partitions Maintenance works: Such as cleaning, xing lines, oorings, etc Bharat Scientificc World offers lab furniture-solutions for the following Educational Institutes: Schools, colleges, etc Research Labs Industries: Pharma labs, Food labs, Microbio labs, Biotech Labs, Chemistry Labs, etc Diagnostic Labs Commercial Labs Testing and analytical Labs Mini Lab for home and small establishments Our Lab Furniture is based on modular principal. The Lab furniture can be shifted inrequirements, it can lead to completely new layout solutions or future.Dependingingenious size grid for the basic components provides a maximum onsupplement existing furniture. The consistent adherence to an the situation and of design possibilities in every functional area of the laboratory. BHARAT SCIENTIFIC WORLD provides a complete Lab turnkey solution . We offer lab designs and layouts, lab furniture, different kind of workbenches, consultation etc. We have a skilled team of professional designers, experienced technicians, and talented execution team. We do everything Every workspace environment has its own special requirements. We offer a wide range of standard products and solutions for numerous industry sectors. Our large variety of products and services ensures that you get everything you need from one place. Lab Furniture Lab Interiors Lab Consultants Manufacturing and supply of Lab Furniture Lab Storage such as Cabinets, FRP storage, Lab Cupboard, etc Fume Hoods Laboratory Accessories such as Lab Sinks & Faucets, Lab Stools, Gas Taps & Pipeline Refurbishing and Renovation of Existing Lab Consultation services Aluminium Partitions Maintenance works: Such as cleaning, xing lines, oorings, etc Bharat Scientificc World offers lab furniture-solutions for the following Educational Institutes: Schools, colleges, etc Research Labs Industries: Pharma labs, Food labs, Microbio labs, Biotech Labs, Chemistry Labs, etc Diagnostic Labs Commercial Labs Testing and analytical Labs Mini Lab for home and small establishments Our Lab Furniture is based on modular principal. The Lab furniture can be shifted inrequirements, it can lead to completely new layout solutions or future.Dependingingenious size grid for the basic components provides a maximum onsupplement existing furniture. The consistent adherence to an the situation and of design possibilities in every functional area of the laboratory.